For 33 days we held a container through an online circle listening for her message to each of us. 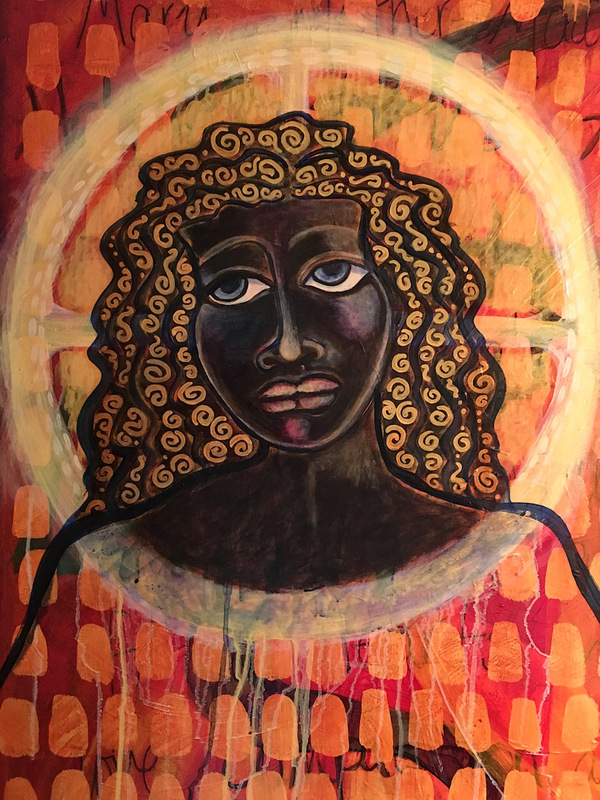 Our paintings expressed the unfolding of our relationship with the Black Madonna in a process of discovery. We explored the symbols of her image throughout the world, and were guided on a sacred pilgrimage of the heart as we heard her voice within us. Sue Monk Kidd wrote of a Black Madonna her in book, The Secret Life of Bees, as well as her memoir, Traveling with Pomegranates. It was a journey in seeking the Divine Feminine for each of us as well. As I began this painting of Mary, a churning of turmoil and violence arrived in our city of Charlottesville, VA. I wrote these words on my canvas as I listened to headlines of racial strife and civil unrest erupting in the streets of the small college town where I listen to music on Fridays, eat lunch with colleagues on the Downtown Mall, and raised my children. As the day progressed, the chaos increased, and I tearfully painted 19 prayers in red for the people who were injured in the clash of white nationalists and counter protesters on the streets of this historical place I’ve called home for many years. More trauma and an “egregious display of hatred, bigotry and violence” ensued as the hours passed, and the progress of the painting captured my impressions of the happenings that day. In reading and research, I found words by Dr. Clarissa Pinkola Estés, author and activist: The Black Mother lights the treasure forward from the dark… dark that others might call chaos…And further, to strengthen ourselves to push back in ways within our reach… …that Our People, Our Nations on Earth Be Not Divided, Rather Be United. So I continued to paint. Symbols of my spiritual journey, a line in connection to Infinite Wisdom, marks representing the Divine Feminine, and more prayers. Processing what was happening in our town, our country, our future. 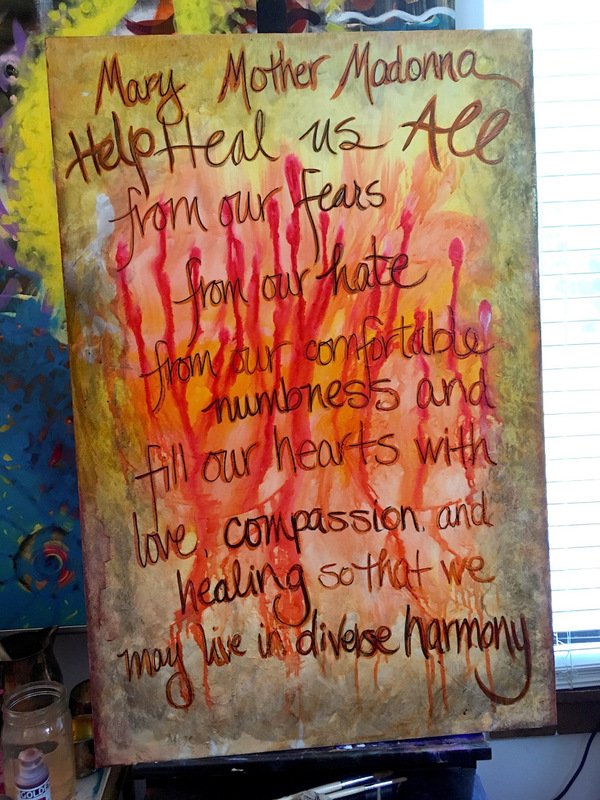 I painted more prayers in white for healing, love and compassion, and the grace to be able live in diverse harmony. And one, in reverence to the memory of Heather Heyer, who lost her life in the chaos. The days and weeks passed. I would paint for hours on some days and other days, my painting languished. I would look at the strokes and feel a sense of loss, of change. She wanted to be a composite of color and light, symbolic of diversity and connection. This method of painting I’ve studied is called Intentional Creativity, developed and taught by my teacher and mentor, Shiloh Sophia. 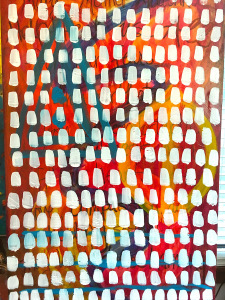 There are many steps associated in this process, each layer a representation of the conversation between spirit and mind, painting and writing. As I write words on the canvas or in my journal, I listen to what comes up in my thoughts, and then I use paint, color and brush strokes to represent what I have pondered. It is a dance between Divine Intelligence through my consciousness to the brush onto the painting. A process of being mindful, listening to what shows up, and paying attention to the brush as it moves through me onto the canvas. The next impression I received was a medicine wheel. A symbol in ancient cultures of balance and harmony. Contemporary representations of the medicine wheel emphasize the quest for harmony and balance, both within ourselves and with all communities and creatures on earth. The wheel also symbolizes a graphic reminder that change is inevitable, that development is a life process, and completing a circle of wholeness is a goal worthy of our attention. It seemed to be an answer to the many prayers and intentions that I had painted onto this canvas, for myself and for our community. And then the shape of the Madonna wanted to appear. I saw her image filling the circle and began to make the sacred marks that would bring her into presence. I’ve painted faces over the past few years, learning to shape the nose, brows, lips, neck, hair, and eyes, and her lines began to take form. More than that, her expression began to develop as I worked. It was a surprise and I was curious as the color and lines revealed her presence. The medicine wheel became a circle of light illuminating her from behind. Her spirit became more apparent as I progressed and she began to come to life. I typically don’t paint images in a realistic way, my interpretations tend to be more abstract and symbolic. But she wanted her expression to represent the sadness, the pain the Charlottesville community experienced in August of 2017 and the aftermath of changes that followed. She wanted to be a composite of color and light, symbolic of diversity and connection. A blue eyed woman of color. My intention was to be mindful of the strength she embodied, her vulnerability in this madness, and the pain that has continued to divide people from fear, long held beliefs, and the misuse of power, trust, loyalty, sincerity, wisdom, confidence, stability, faith, heaven, and intelligence. She was making her presence and intent in protecting the people Charlottesville with wisdom and loyalty in response to the negative media surrounding the events that happened. Her message was also telling me that she wanted to hold all the people, ones were injured, as well as ones who spread violence and separation, those who were harmed, the ones who stayed home, and especially, the woman and men who died. And I listened to her voice, painted all who came, with differing intentions, who she holds in her embrace. This process has motivated me to use my art for social justice and positive activism. 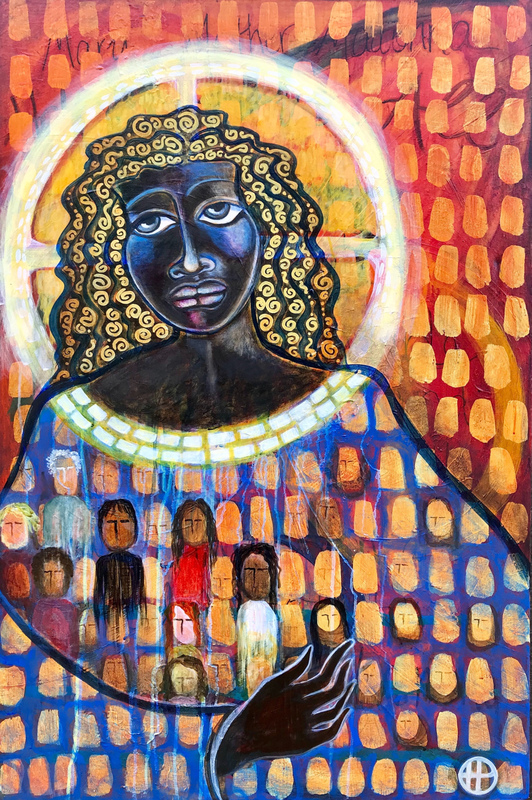 In addition, I am very honored and humbled to have Marianne Williamson share my painting, Black Madonna of Charlottesville, on Instagram! 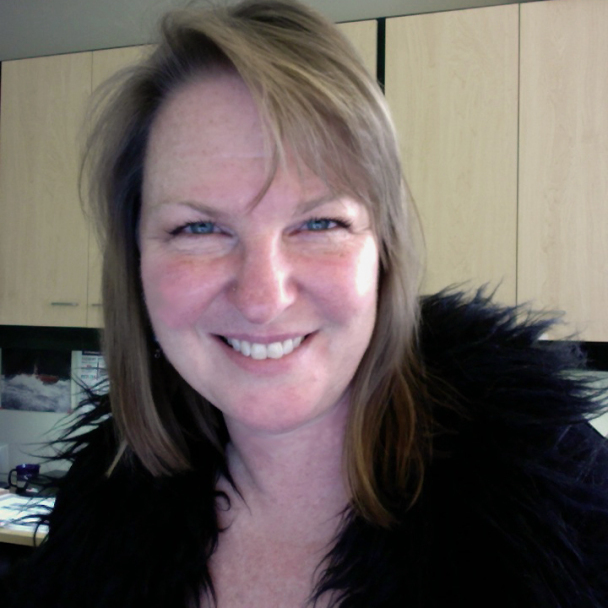 Hobby Parent is an artist, Intentional Creativity Coach and Teacher. She lives and works in her home & studio West of Charlottesville, Virginia, in view of her beloved Blue Ridge Mountains, enjoying nature and its vast sources of artistic inspiration. She works in acrylics, watercolor and mixed media, as well as graphic design. She began painting, drawing and illustrating in high school, although she has been an artist for as long as she can remember.